The STS-134 crew have completed the installation of ExPRESS Logistics Carrier -3 (ELC-3) to round up a busy Flight Day 3, which opened the docked phase of the mission. 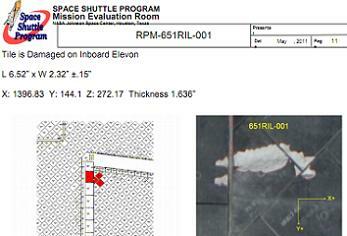 Meanwhile, the Damage Assessment Team (DAT) are carrying out a Focused Inspection (FI) review of the additional imagery gained during Endeavour’s R-Bar Pitch Manuever (RPM), which revealed several dings on her belly. Endeavour is performing admirably on orbit, with her cryo status projections currently showing a healthy margin for her lengthy 16+0+2 day mission, with additional capacity – O2 limited – of two days and three hours baselined, extending further out with the use of her Station-to-Shuttle Power Transfer System (SSPTS) to four days and 12 hours on top of the baselined mission. With the orbiter now docked to the International Space Station (ISS), she is able to draw power from the orbital outpost, reducing her own Fuel Cell’s dependence on her Power Reactant Storage and Distributation (PRSD) supplies. The SSPTS also aided Discovery’s twice extended STS-133 docked mission, although STS-135 will not be able to benefit from this system, given the SSPTS is not installed on Atlantis. No additional issues are being tracked by the Mission Evaluation Room (MER) past the five minor items, all of which have no mission impact. In fact, the only additional issue – known as a “funny” – relates to the Multiple Headset Adapter Ports J1 and J2 not transmitting. Notably, all of the orbiter’s main systems are working as advertised, including the Auxiliary Power Unit (APU) heaters – the subject of troubleshooting during Endeavour’s extended stay at Pad 39A. “All APU subsystems are performing nominally. All heater systems are operating on the A circuit,” noted MER status (L2), which overviewed all systems currently being used by Endeavour, such as the following examples. 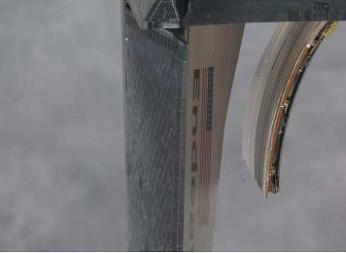 The main focus for engineers on the ground is the effort to clear Endeavour’s Thermal Protection System (TPS) for entry. The process – carried out by the DAT engineers – begins with ascent footage and data, prior to moving to the scheduled inspections carried out via Flight Day 2’s scans by the Orbiter Boom Sensor System (OBSS) package. “The STS-134 FD2 OBSS Surveys went well. OBSS grapple occurred at 2:00 am and it was unberthed from the Stbd MPM at 2:05 am Tuesday,” noted a MER review (L2) into completed task. “The Stbd T0 umbilical and OMS pod were surveyed from 2:55-3:15 am. Stbd RCC was surveyed from 3:25 am to 4:43 am. Nose RCC was surveyed from 5:12 am to 5:43 am. Port RCC was surveyed from 6:16 am to 7:51 am. The Port T0 umbilical and OMS pod were surveyed in between Port RCC scans per procedures. The OBSS was berthed on the Stbd MPM at 8:27 am. The results of the FD2 Inspections confirmed Endeavour’s critical Reinforced Carbon Carbon (RCC) panels to be in excellent shape, along with other areas of the orbiter covered by the OBSS’ sweep. “LESS/RCC team cleared all regions of interest. OBSS Survey started 5/17 at around 3am, and final PRT disposition occurred 5/18 at around 8:00 pm ( 29 hours). No ROI (Regions Of Interest) exhibited any damage characteristics,” noted a Flight Day 3 DAT presentation (L2). 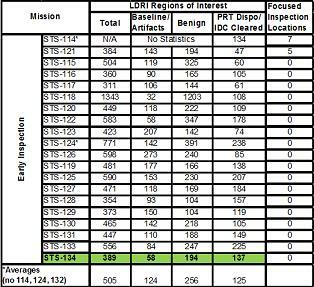 A total of 389 areas were reviewed – one of the lowest counts since the implementation of the OBSS’s Laser Dynamic Range Imager (LDRI), with the 137 ROI count much lower than Discovery’s STS-133 count of 225. The review of all ROIs resulted in the RCC being cleared for entry – although a second sweep will be undertaken during Endeavour’s Docked Late Inspections (DLI) ahead of departing from the ISS. The FD2 data will provide a baseline for those late inspections. The other major data gathering exercise was carried out ahead of Endeavour’s docking on Flight Day 3, as the ISS crew took hundreds of 400m, 800mm and 1000mm photographs (hundreds of hi res photos available on L2) of the orbiter as she was commanded through her RPM backflip. This manuever allows of all areas of the orbiter to be photographed, and – due to the limitations of the OBSS’ reach – provided the DAT with a full sweep of Endeavour’s belly. No major flags of concern have been raised at this time, although Endeavour does have seven cosmetic dings on her belly. While it is likely none of the damaged tiles will be of any concern for her entry at the end of the month, the DAT engineers always carry out a full review of any areas of interest, opening with their Focused Inspection (FI) discussion, allowing them to inform the Mission Management Team (MMT) if a FI is required or not. Most of the damaged tiles are expected to be cleared by the DAT within hours. However, three areas – more notably on the inboard elevon – are being called a FI candidate, as much as all damaged areas hold such a title until they are cleared from the closer inspection. According to DAT presentations (L2) the elevon’s damaged area covers a length of about 6.5 inches and is 2.3 inches wide – with a margin of error of .15 inches. The depth – one of the key parameters – of the damage is 1.63 inches, the deepest of all the damaged areas. However, its location will also be part of the discussions, given some areas are more susceptible to the heating of re-entry than others. A FI has a placeholder on Flight Day 6 of the mission, should it be required, which would be only the second time such an inspection was called for. Currently – according to MMT chair LeRoy Cain, actions have been taken to protect the placeholder of a FI on FD6, while another 24 to 48 hours of evaluation will continue on the forward plan. Ironically, it was Endeavour which required the use of the OBSS’ cameras and sensors to take a look at a “gouge” on her belly during her STS-118 mission. Notably, the FI discussion package included STS-118 presentations on the area of damage – caused by an ice impact – which required the use of the OBSS midday through her mission to the ISS, although the data gained did result in a MMT decision that no repair was required. 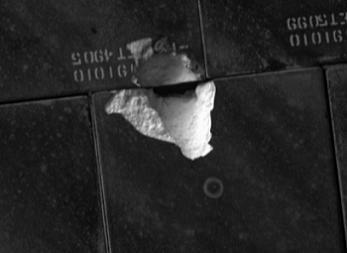 Post landing images of Endeavour on the Shuttle Landing Facility (SLF) showed the damage had worsened during re-entry, along with no ill effects to the underlying structure on the orbiter when the damaged tile was removed in the Orbiter Processing Facility (OPF). Also under consideration will be the cause of the dings on Endeavour’s belly, especially after ascent imagery and photographs of the separated External Tank (ET-122) showed it enjoyed a clean ascent, with only a few minor liberations from the tank’s Ice Frost Ramps (Ice Frost Ramps). Although the ascent review is ongoing, current information has not listed any TPS impacts from the minor liberations spotted by the camera on the ET. (All images via L2. Extensive coverage is being provided on the news site, forum and L2 special sections – the latter of which is the world’s best front row seat to Shuttle missions. With specific and extensive flight day coverage, from interactive “one stop” FD live coverage in the open forum, to internal documentation, photos, videos and content in the specific L2 FD areas).